This type of system is found in many commercial buildings. Cold water enters the building from a rising main and is stored in an intermediate cold water tank. The cold water is fed from the tank by gravity to the points of use without recirculation. 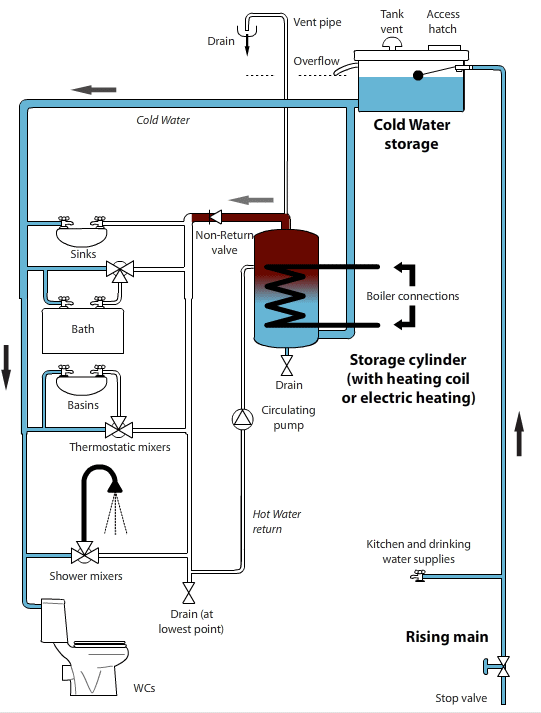 Cold water is fed from the storage tank to the calorifier (hot water cylinder) where it is heated. There is a continuous flow of water from the calorifier / cylinder around the distribution circuit and back to the calorifier. This ensures that the hot water is quickly available at any of the taps, independent of their distance from the calorifier. The circulation pump is sized to ensure that the return temperature back to the calorifier is not less than 50°C. The vent pipe at the calorifier should be linked to a separate tundish/drain. This should only discharge water under fault conditions. These design principles also apply where an electrically heated cylinder or direct fired storage heater is used instead of a calorifier.